Again, lack of time can be a troubling factor, but not only one; with too much information out there and not enough expertise it can be difficult to balance your diet correctly. Fortunately, the Beach Body’s experts created a fix for these problems, or more precisely 21 Day Fix – workout and nutrition combined routine that will provide the best results within short period of time. The program requires you to do sets of exercises for only 30 minutes a day, while at the same time following 21 Day Fix Containers meal plan. 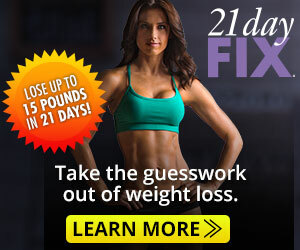 What is 21 Day Fix Containers Eating Plan? Beach Body created special color coded container system to help you organize your diet. There is a set of containers with different sizes and colors. Size determines the amount and color the type of food – simple as that. No more headaches about precise measuring your food or annoying calories counting. You only need to pick your favorite food and put it in the right container and if the amount fits in, you get to eat it all. First thing you need to do is to determine the calorie bracket you’re in, which depends on your weight and targeted weight loss. Apart from the workout program and colored containers, in 21 Day Fix kit you will also get the Eating Plan book, which will help you through the meal organizing process. After filling up the containers, you choose the eating order. Beach Body recommends you plan for 3 main meals and 2 snacks in between. There are many delicious 21 Day Fix approved recipes available online, so it is rather easy to plan meals and snacks for the entire week. For better organizing you can use Excel sheet to create your own weekly eating plan and put it on your fridge, so you know what is planned for the day the moment you get up in the morning.